South Africa, 13 July 2018 – South Africa’s 64-dish MeerKAT telescope, one of the SKA’s precursor telescopes, was officially inaugurated by Deputy President David Mabuza at a ceremony near Carnarvon today. Built and operated by the South African Radio Astronomy Observatory (SARAO), and a decade in design and construction, the MeerKAT facility has already begun science operations. A stunning new panorama obtained by the telescope was unveiled during the event, revealing extraordinary detail in the region surrounding the supermassive black hole at the centre of our Milky Way Galaxy. 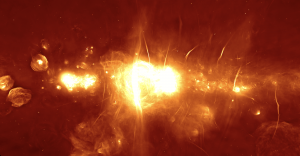 MeerKAT is an SKA precursor telescope and it will ultimately be incorporated into the SKA’s mid-frequency array of some 200 dishes in the Karoo region, but it is a world-class facility in its own right and promises to deliver even more exciting science in the coming years. The 64 dishes provide 2,000 unique antenna pairs, far more than any comparable telescope, resulting in high-fidelity images of the radio sky. The image unveiled today shows the clearest view yet of the central regions of our galaxy. The centre of the Milky Way, 25,000 light-years from Earth, is forever enshrouded by intervening clouds of gas and dust, making it invisible from Earth using optical telescopes, but radio wavelengths pass through the dust. You can read the full release on the SARAO website.